When you eat or drink sugar the sudden energy surge your body experiences is followed by an insulin surge that rapidly drops the blood sugar level-so two hours later, you feel famished and tired. To keep an even keel, replace simple carbohydrates with complex ones so the absorption is more controlled and you experience long-term satiety. While sugar should be eaten, it should come together with fat or some element like fiber-as you would find in fruit-so you can absorb it a bit more slowly. This high level of sugar intake is very unhealthy and contributes to obesity, Type II diabetes, heart disease due to elevated triglycerides, kidney stones, dental caries, chronic tiredness and reactive hypoglycemia. Decreasing your sugar intake is as simple as avoiding foods that are high in refined sugars, such as soft drinks, candy, cake and donuts, as well as most condiments. When you purchase sweetened food, look for products that are sweetened with apple juice or stevia, rather than sugar or high-fructose corn syrup. Although they taste sweet food products that contain high fructose corn syrup should be avoided. The body processes the sugar in high-fructose corn syrup differently than it does old-fashioned cane or beet sugar, which in turn alters your body's natural ability to regulate appetite. High fructose corn syrup blocks the ability of a chemical called leptin, which is the way your fat tells your brain it's there. It's not so much the 150 calories in the soda pop-it's the fact at that same meal you will normally consume an extra hundred calories of food than you would have. Contrary to what its name suggests, enriched flour is actually poor in nutrition because most of the grain's nutrients are destroyed in the refining process. The reason they enrich it is because they already stripped out anything that was nutritious, and they add a little bit back so it doesn't look so bad. Instead, look for whole grains and whole grain flours. It has its kernels, it has its B vitamins-all the things you want to be in there. Found mainly in animal products, avoid saturated fats that are solid at room temperature, like lard. You can actually use this kind of material for furniture polish-lots of fun things-but don't put it in you. To increase their shelf life, certain oils are hydrogenated. This process turns the oil into a solid at room temperature, but it also makes the oil unhealthy. This stuff is great because it doesn't go bad, but it's very bad for you. 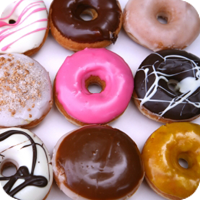 Avoid food products that contain hydrogenated oil, often labeled as trans fats.